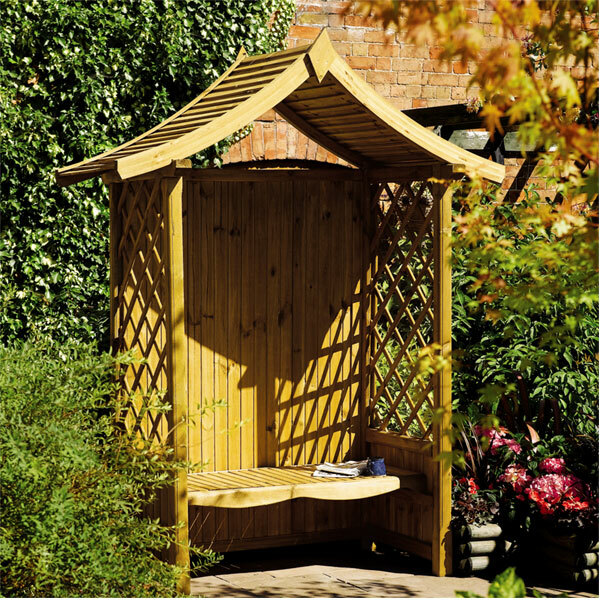 Transform your garden into a place of peace and tranquility with the oriental temple inspired arbour. The innovative design of the roof will protect you from the weather and the glare of the sun. 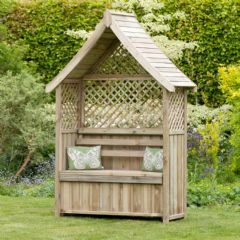 This stylish arbour incorporates a wonderful seat from which to view your garden and the lattice side panels help allow a breeze to circulate keeping you cool in the warmest weather. 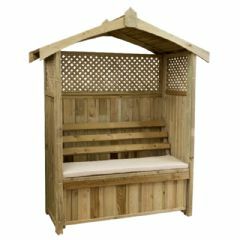 Manufactured from FSC Certified managed forests using a mixture of Fir, Spruce and Pine that are known for their strength and being pressure treated ensures that this arbour is weather-resistant and long lasting. FSC Mixed Wood Species: Fir, Spruce and Pine. 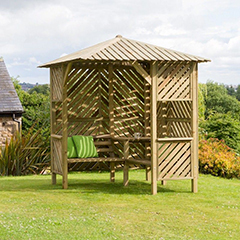 Please Note: The Tenbury Arbour will arrive flat-packed and two-man assembly is recommended. 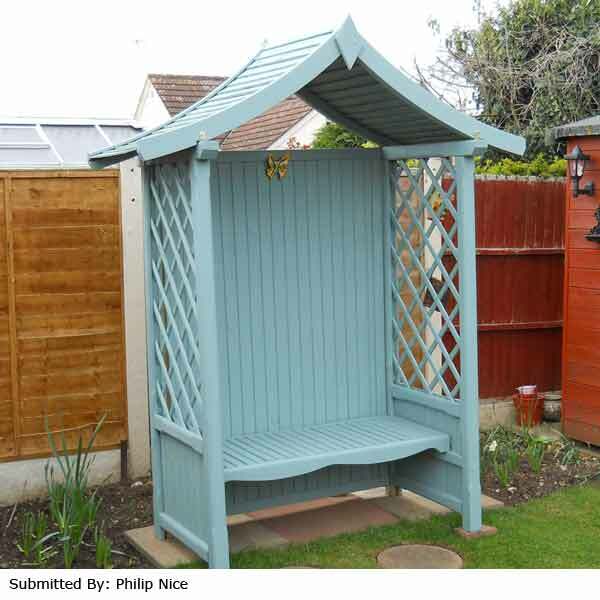 I liked the look of the Tenbury Arbour and was very pleasantly surprised by the solid build, Nice quality and I'm very happy with the vfm. Our arbour turned up well within the anticipated two weeks, and was exceptionally well packed for transit. Construction is really a two man job, and good DIY skills are essential. The only glitch with ours was that the seat appeared to have been shipped with a packing strip on either side, which needed removing to allow the seat to fit squarely. The end result is an individual, high quality piece of garden furniture which we have already been enjoying to the full. All-in-all, an excellent value purchase. My Arbour arrived within the 10 -14 days. I did query the dispatch when it got near to 10 days and it had not arrived, but one quick email was all that was needed and confirmation that if I did not receive a call from the company that dispatch it by the Monday then to contact them again -this was not required. 2 person assembly is required, but very straighforward. No pre drilled holes to put it together, but a minor issue. Contents a little bit damp on arrival, but a quick wipe down soon removed the damp spots. It looks exactly like the picture - what you see is what you get. 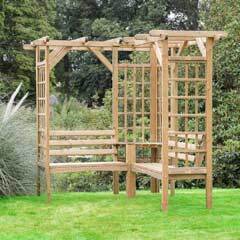 The quality of the finish is very good, the lattice work is beautifully rounded off and no rough edges in sight. 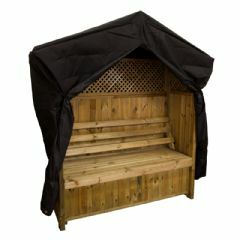 I would certainly recommend this product it looks beautiful in my garden and will last many years to come. This is a very high-quality product.  Very solidly made and, unlike similar products, the fixtures and screws are also of good quality. It was delivered within 9 days in good protective packaging. Construction requires plenty of flat open space and two people as components are heavy. The construction process was straightforward and the instructions provided were adequate and less confusing than often appears to be the case with such items. Overall it is a very good item which requires no additional finishing and looks and feels very solid and likely to last! My husband and father put this together. As there were no pre-drilled holes we had to go out and purchase a powerdrill. Lots of rough edges, some cracked panels (side and roof support). We also decided not to add the back support to the seat area as without putting it in you get a lot more room. All in all it looks good and gets lots of favourable comments. Looks good when up. Wood too rough for painting so can only stain or leave as is. Screws and brackets initially look unsubstantial but when fully assembled its very sturdy. Note, the seat dimensions are smaller then the stated width which includes the roof. Overall, quite pleased with the finished product. We would like to thank this Customer for placing a review. The width of the seat is 123cm.